.Also called 'gift economy', 'gift culture', 'gifting', 'gifting economy'. 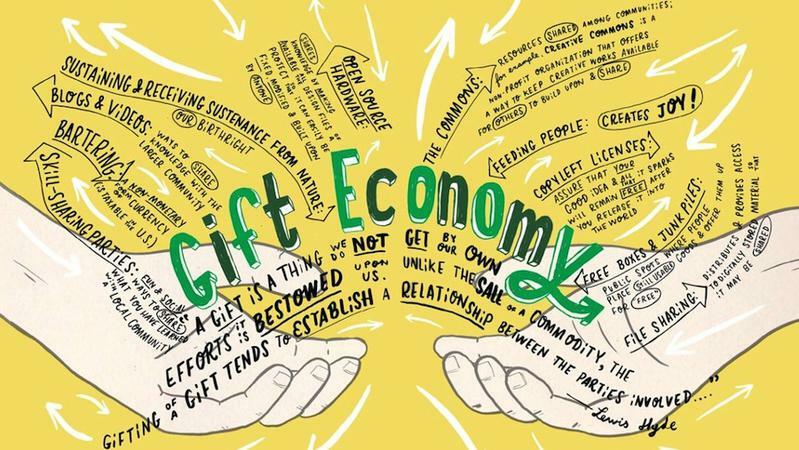 A gift economy, gift culture, or gift exchange is a mode of exchange where valuables are not traded or sold, but rather given without an explicit agreement for immediate or future rewards. This contrasts with a barter economy or a market economy, where goods and services are primarily exchanged for value received. Even though the origins of the Gift Culture are uncertain, some anthropologists suggest that hunter-gatherer societies basically acted as Gift Economies (and they did not practice barter, as it’s commonly believed). Lewis Hyde, author of The Gift points to the Kula ritual as an example; this is an ancestral gift circle, which continues to be performed nowadays in the Papua and New Guinea archipélago. Similar rituals have existed in other Pacific islands for centuries. Nevertheless, it is not necessary to make a trip to the past. We have very clear examples in the present, such as among our friends and family. We do favors for each other, cover necessities unquestioningly, without implying any negotiation or interchange. We consider these relations of mutual trust, confidence, and support to be crucial. Above all, what really matters for us is to explore whether or not this type of relation could be created with people beyond our inner circles. Is it possible to cover our necessities (without using exchange or money) interacting with tens, hundreds, or thousands of persons? Authors such as Lewis Hyde, Charles Eisenstein, and Genevieve Vaughan are associated with a revival of gifting in our current society and envisioning how we could transform our world through these practices. Many small businesses include an element of gifting in their business model (sometimes synonymous, or in conjunction with, donation, pay it forward, or PWYC). Barter is not considered part of 'gift culture', per se, as there is a direct and agreed upon exchange.